Two weeks ago Blaze Pizza, a Chipotle-style pizza joint opened up right off the Belmont redline stop in downtown Chicago with so many possible pizza combinations if you came back 100 times you still wouldn’t have tried them all. I had the chance to try a few pies and talk with the Executive Chef Brad who was in from California to open the first Chicago location. Similar to Chipotle, Blaze uses only the highest quality ingredients from the garlic to the tomatoes that make up the sauce. As a chef with a food science background Chef Brad tinkered with the typical dough recipe in order to get a perfectly fluffy, crusty, chewy, and flavorful base. I could tell the more I talked to Chef Brad that this dude is seriously passionate about pizza and that passion definitely showed up in everything from the assembly line pizza to the employees. All pizzas are approximately 11 inches, baked in just 180 seconds in an 840 degree pizza oven, and both signature pies and build-your-own with unlimited toppings are just one price of seven dollars. That means if you wanted you could put five different meats, 5 different cheeses, 5 different veggies and have it still be the same price! There are over 40 fresh-made sauces, hand-selected veggies and a variety of artisanal meats and cheeses. Blaze Pizza’s menu also features signature salads, fresh lemonades, craft beer and wine and house-made S’more Pies. For pizza fans with specific dietary needs, Blaze Pizza offers gluten-free dough and vegan cheese. The restaurant also offers online ordering. I also discovered that Blaze is diet friendly with a nutrition calculator online so you can pre-plan your pizza so you don't ruin your new years resolutions! 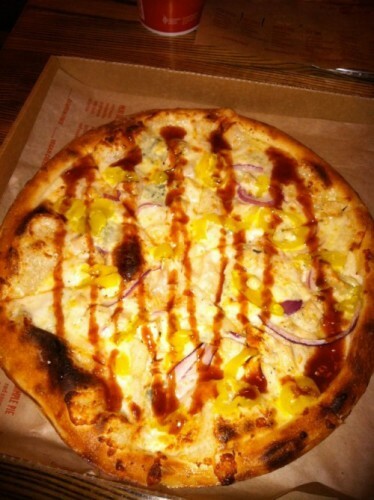 The signature pie I choose was the bbq chicken which was absolutely delicious with the addition of the banana peppers and the bbq sauce drizzle on top gave the pizza the perfect sweet tang without being overwhelmingly smoky. I also made my own pie with a regular red sauce base, ricotta cheese, ovalini mozzarella, chicken, roasted red peppers, and roasted garlic. All of the ingredients on both of the pizzas tasted fresh and I could tell Chef Brad really cared where his ingredients were sourced from. I know that if I would have tried the simplest pie it would have been just as tasty as one loaded with additions. Chef Brad says that his favorite pie is the Art Lover, but patrons really go crazy for the White Top and the BBQ Chicken. If you’re interested in giving Blaza Pizza a free try leave a comment about what your dream pizza would look like for a chance to win one of three free pizza coupons! All commenters will be entered into a random drawing and winners will be announced Friday!